A few weeks ago I was talking to a friend at church who was lamenting how hard it was to get older generations to help in the nursery. Now, aside from the frequent comments I hear from older women that they’ve already “had their turn” or “done their job”, I understand that there are other considerations to keep in mind. These usually revolve around the physical by-products of growing older: diminishing balance, visual/hearing, and strength issues come into play as we age, preventing us from safely and effectively taking care of young ones. What I am suggesting here are some ideas for older, Titus 2-type women, who are truly and sincerely confounded as to how to help young moms and/or nursery workers at church. Even if you’re not a church-goer, the tips below may also be a blessing to the young mother who lives next door, or down the street. Never feel you’re “too old” to reach out, meet and help out a young mom – you know that she will surely be appreciative and thankful for any effort you put forth! 1) Visit briefly and pray with her. Or you can just see if she has any needs. I know that the first time you do this, you may be met with a bit of skepticism. I mean, this isn’t really “done” these days, and so yes, it may come across as a bit strange. But persevere! At church, you can just pop in and let the volunteers know you’ll be praying for them during the service (and then, of course, do so!). Better yet, offer to pray right there with them. 2) Bring doughnuts or coffee or fruit. Nothing is sweeter than seeing someone at your front door with a cuppa, or maybe a small bowl of fruit salad or a home-baked goodie. It doesn’t need to be anything big or expensive, just something that comes from the heart. Church nursery workers will also enjoy a small treat, making them see that they really are being thought of! 3) Provide a bathroom break. If you really need to sneak out during the service to, um, answer nature’s call, how ’bout swinging by the nursery and seeing if any adults there need to do the same? OK, so you may not be able to offer this assistance to the new mom next door, but this is a great idea to help the mom or volunteer in the nursery! Perhaps you’re not willing or able to be on the regular schedule, but could you consider filling in when there’s a last-minute need? Remember the days of your baby waking up with a fever or getting sick on the way to church? Those may be fading memories in your own life, but they are certainly a present reality to some young mom you know! And you will also endear yourself to the nursery coordinator, who has to scramble at the last minute when those last-minute emergencies arise, as they often do. Moving out of church and into your own neighborhood, these next ideas are a bit more generalized. 6) Offer to run an errand. Just stop by on your way to the bank, or the post office or the store and offer to pick something up or drop something off. Of course, many times you won’t be taken up on your offer. But just putting it out there speaks volumes…and when you are able to do something, what a blessing! 7) Send a greeting card. Who doesn’t like to get mail that isn’t a bill? And there are so many wonderful blank cards or “thinking of you” cards that can be sweetly personalized with a unique comment or short note from you. 8) Prepare and bring over a meal, or invite them over for dinner or dessert. In the circles I travel in, food is always welcome, and having mom, or mom-and-dad, or even the whole sweet family over is a treat in oh-so-many ways. Being doted on, not having to prepare or clean up, getting out of the house…what a wonderful thing all that can be! 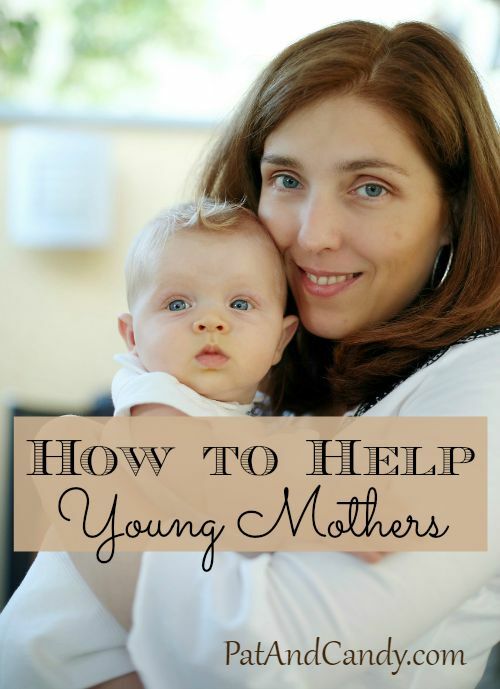 Can you come up with some more practical ways you can help out a young mother, or anyone taking care of little ones? As a young mom myself, I feel so grateful to anyone who offers me time-haha. A meal takes away the time and stress of dinner, and the opportunity to go to the bathroom alone–that’s unheard of! I really love these ideas, especially the one about being a sub in the church nursery. I was just talking with a young mother yesterday, and she was saying that she doesn’t know if she wants to have more children because she really wants to serve more in church but feels like she can’t because her children seem to get sick so often and then she has to cancel. I encouraged her that she was just in a busy season, and that God definitely understands seasons. So I can completely agree–if you don’t have young children, offering to be a nursery sub is such a blessing! And thank you so much for including my post! What an honor. Miranda, it’s so hard for moms of young ones to feel like what they’re doing IS a ministry – at least it was hard for me… I know she was blessed by your words…how kind of you!